First up, here’s the box with shrink wrap. The cover art is very nice really sums up what the game is about: Five scouts that are going to be murdered by Genestealers. 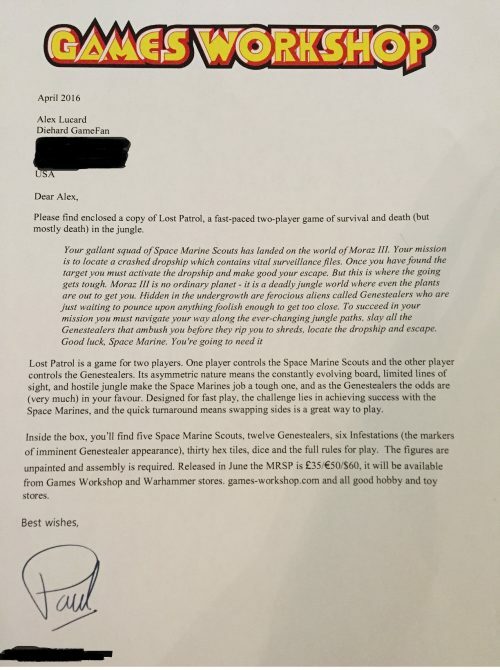 Here is a copy of the letter sent to us by Games Workshop, although this time I remembered to black out the GW employee’s email address as well as our own. This is just to show we received this as a review copy and didn’t obtain the game illegally or anything nefarious like that. As you can see from the letter, the retail price will be 60 USD, which is pretty good for what you are getting, doubly so compared to other Games Workshop pricing. Between this and the “Start Collecting!” boxed sets, GW is really doing a bang-up job of hitting the sweet spot for your wallet lately. 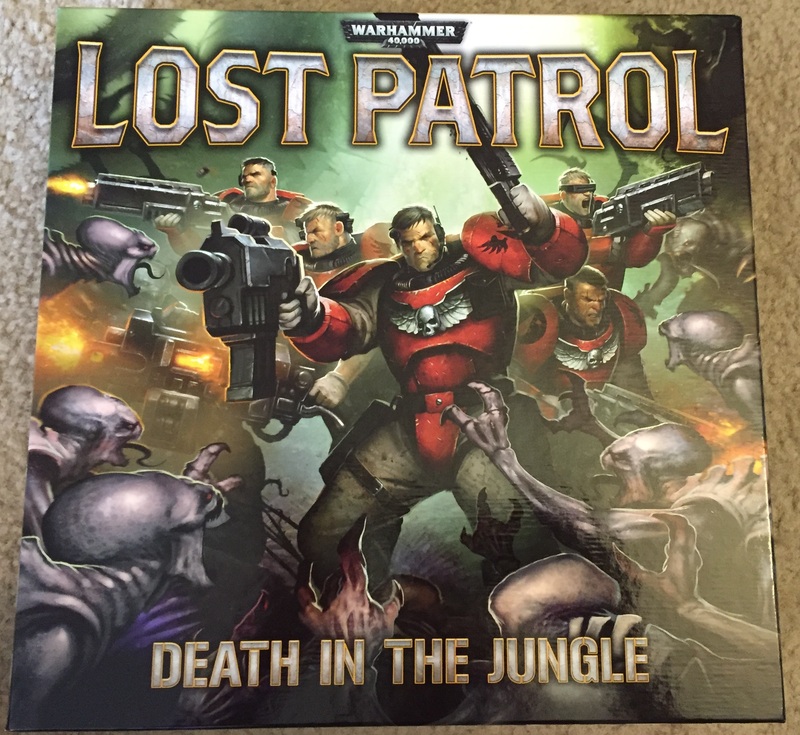 The letter does a fantastic job of telling you what the game is about and what it comes with, so I suggest reading it, especially if this Unboxing is your first real exposure to Warhammer 40K. Also, notice the lack of any embargo date. That’s why this is going up so early compared to the actual release date. Another shot of the cover art, this time sans shrink wrap. The back cover of the box. Note the painted miniatures. Like all GW products not called Heroquest or Fury of Dracula, these miniatures come unpainted and unassembled, so make sure you have a cutter and some glue (plastic or super) when you open this. I know this is old hat to wargamers, but for who aren’t, I don’t want you to be in for a shock when you open the box. 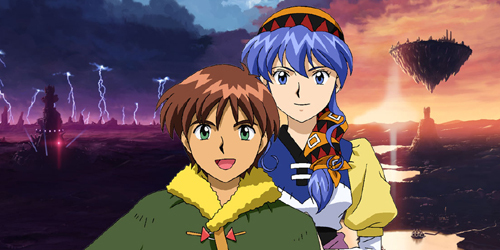 A close up of the basic information about the game. It’s for two players, contains twenty-three miniatures, and should only take a half hour to play. That’s pretty short for a Games Workshop game, board game OR war game. The $60 price tag for twenty-three minis is also pretty fantastic. A normal package of five scouts on their own costs $25. 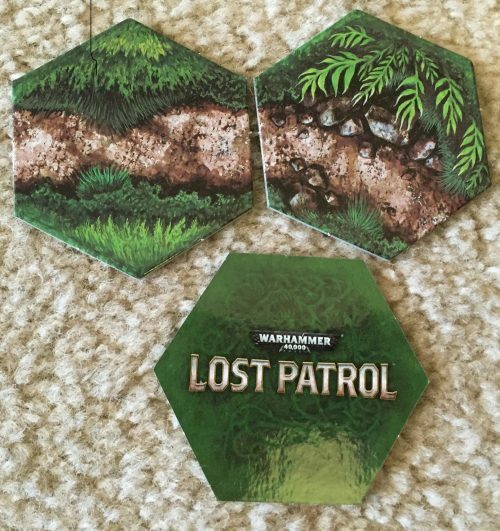 That’s almost half the cost of Lost Patrol right there. 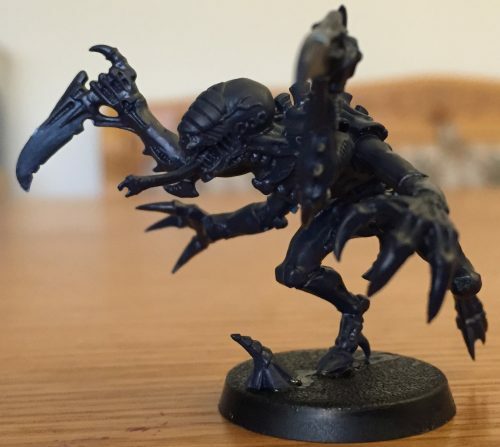 A box of eight Genestealers is $30 and you get $12 in this game. So if you were to purchase all these miniatures WITHOUT Lost Patrol, it would cost you SEVENTY DOLLARS. Instead, you’re getting the figures, the game parts and six Infestation miniatures to boot – all for ten bucks less. 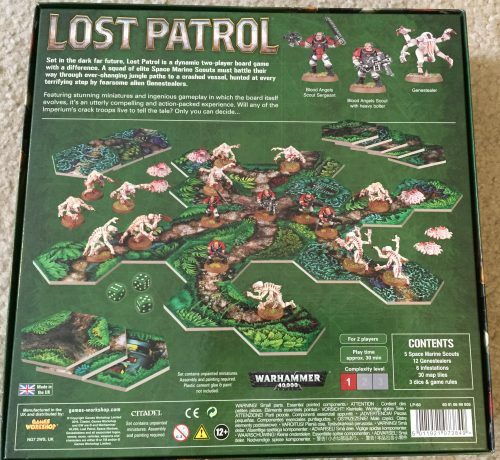 This makes Lost Patrol a must buy for any fiscally savvy Space Mariners or Tyranids player. Like I said earlier, this is a fantastic deal. The inside of the box once the top comes off. Notice the manual with sprues of miniatures underneath. 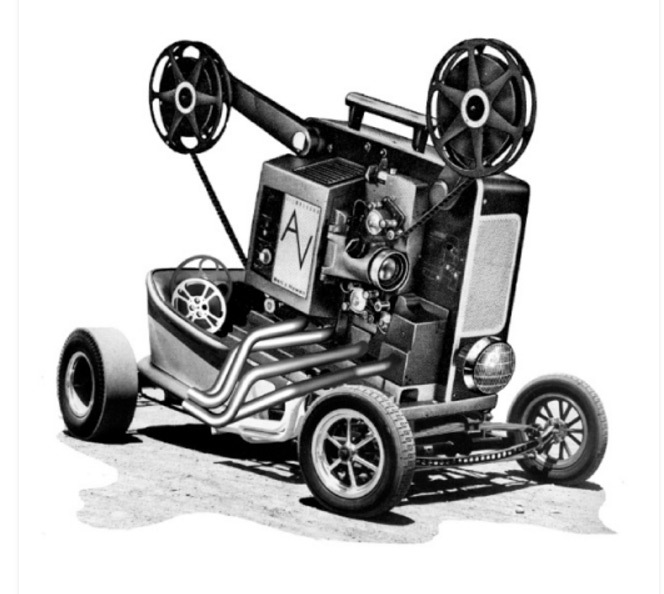 Speaking of the manual, it’s only six pages long! That’s nice to see, as it means you can learn (and thus play) the game quickly. No, it’s not Age of Sigmar with 40K figures (although that might be cool to see). Lost Patrol is its own beast. 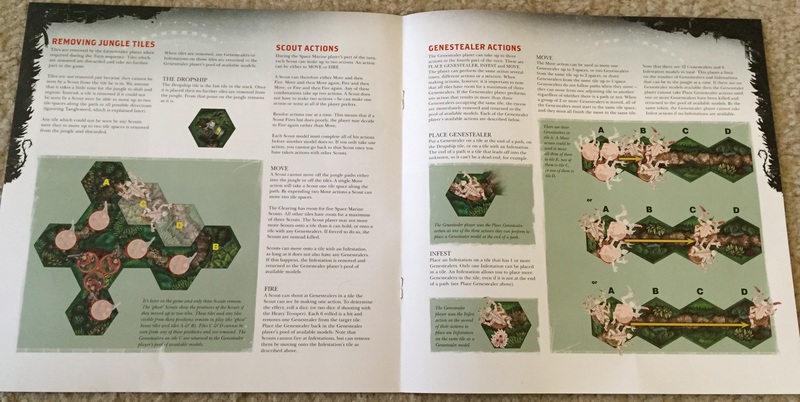 In fact here’s the first two pages of the manual. Here are the second two pages of the manual. Here are the last two pages of the manual. 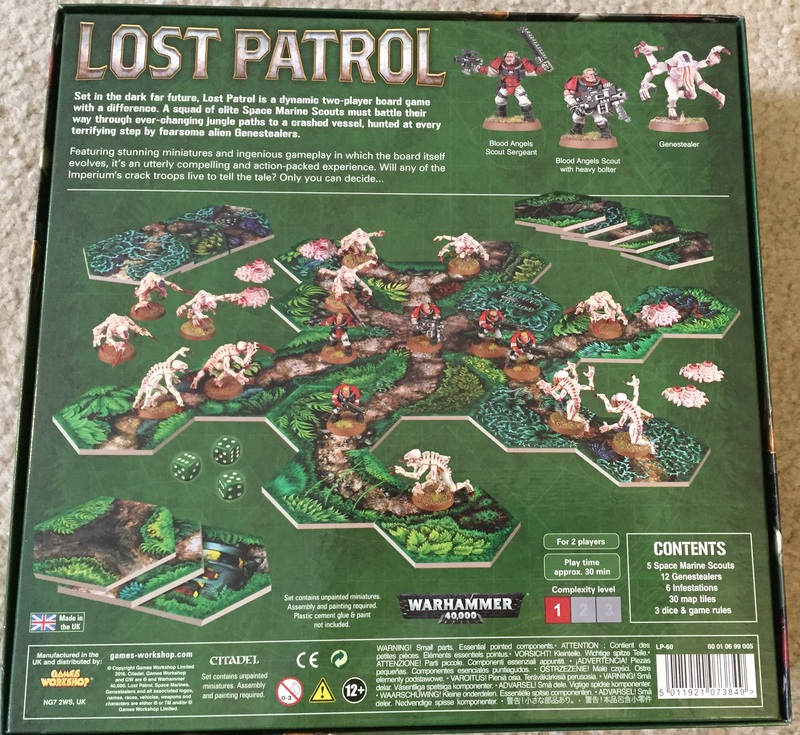 As you can see from viewing these purposely slightly blurry images, Lost Patrol will be easy to learn and allow 40K fans a quick fast paced taste of their preferred gaming universe. Of course, it’ll take longer to put the minis together than it will to play two or three sessions of the game. 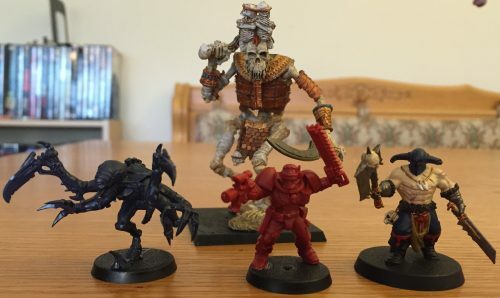 Don’t let that scare you if you’re new to minis-based gaming. Once you give it a try, you’ll see the customization of these little plastic pieces of crack is a lot of fun (although I prefer the painting most of all). The other two tile card sets. Here are three of the tiles punched out. You can see the front of two, and the back of a third. 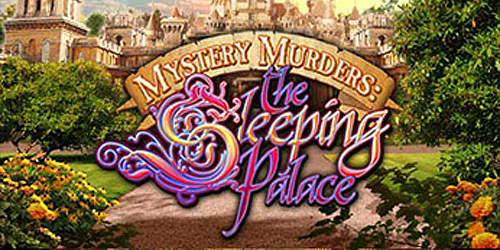 They are very detailed and it will be fun seeing what you make with these ala the D&D co-operative adventure games like Castle Ravenloft or The Legend of Drizzt. 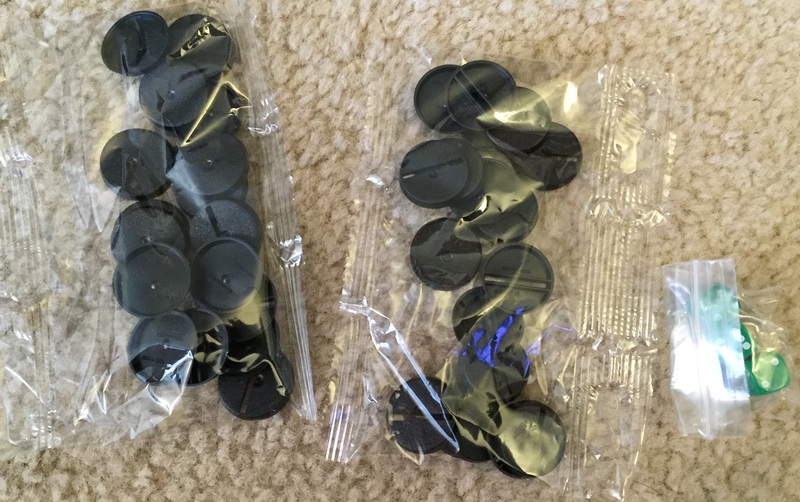 Two bags of bases and some green dice. Note that there are two types of bases even though they are the same size. There are some with slots and some without. The Space Marines gets the bases without slots and the Genestealer Brood get the bases with the slots. This is just a head’s up so you don’t glue minis to the wrong bases. 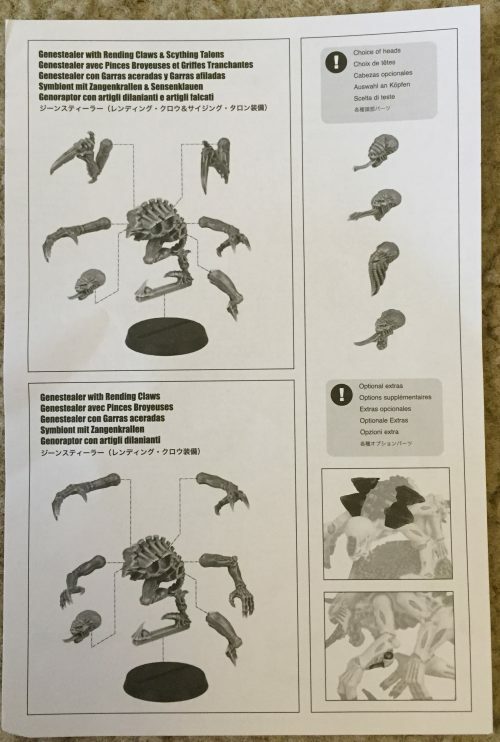 Tyranid Genestealer assembly instructions. Note that these are the same that you’ll find in a regular Genestealer Brood box. 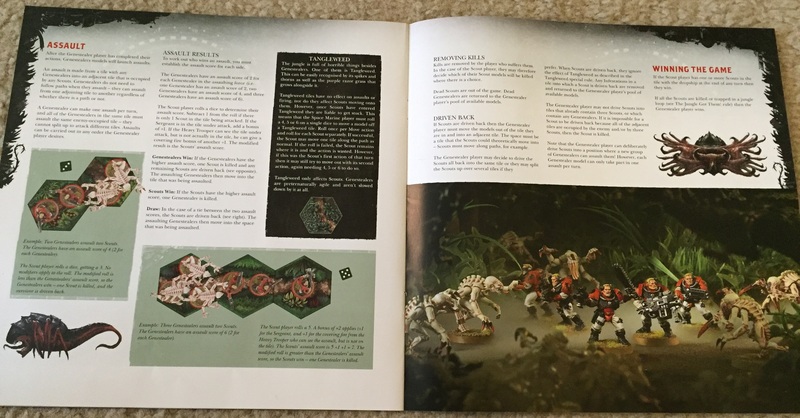 A couple pages of the Space Marines Scouts instructions. Again, these are the same as what you will find in a box of normally packaged 40K Scouts. Here is the Space Marines Scout sprue. Yes it is red like the Space Hulk figure sprues, but it is the exact same pieces and quality you get from a regular Scouts box. It’s just a different color plastic – that’s it. 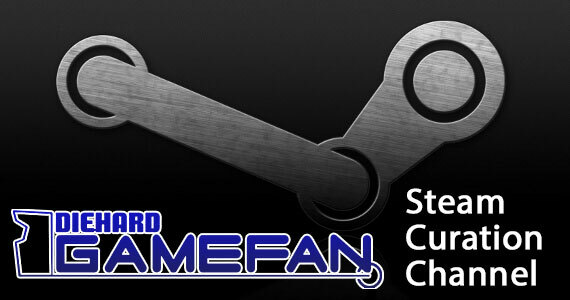 You have the same customization options and ability that you get with regular 40K purchases. This is a big change from the usual board game/boxed sets as the pieces in those almost always have only a single pose options. 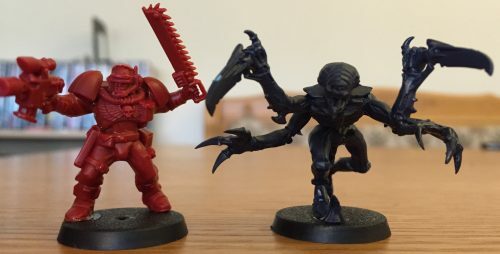 This does mean the figures require more glue and skill than the quasi-snap together figures, so people who have only purchased GW products of this nature may be surprised at the sheer number of parts the Genestealers have compared to their Deathwatch: Overkill or Space Hulk versions. This is okay though, as this just means you’re a step closer to regular wargaming pieces with this purchase. Congrats! 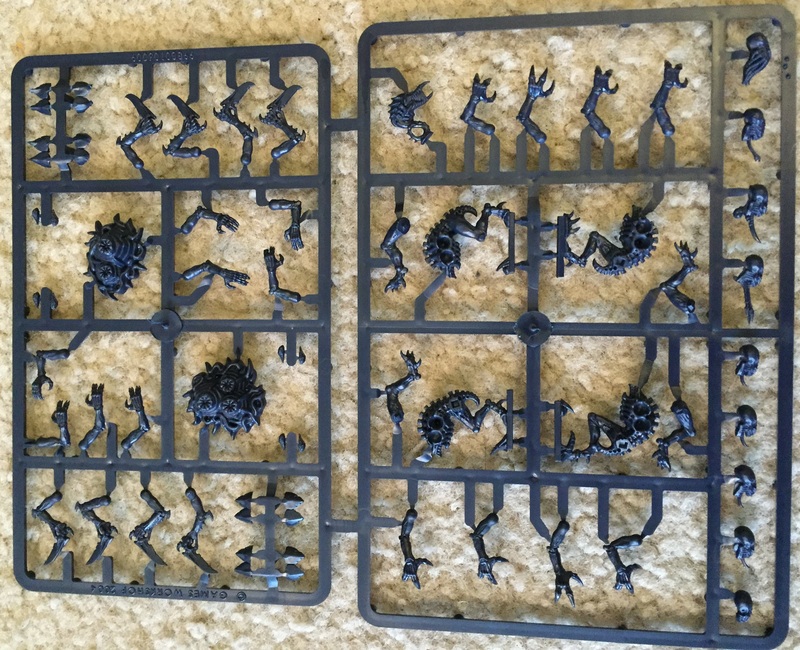 Here is one of the Genestealer sprues. You get three of threes in the box. 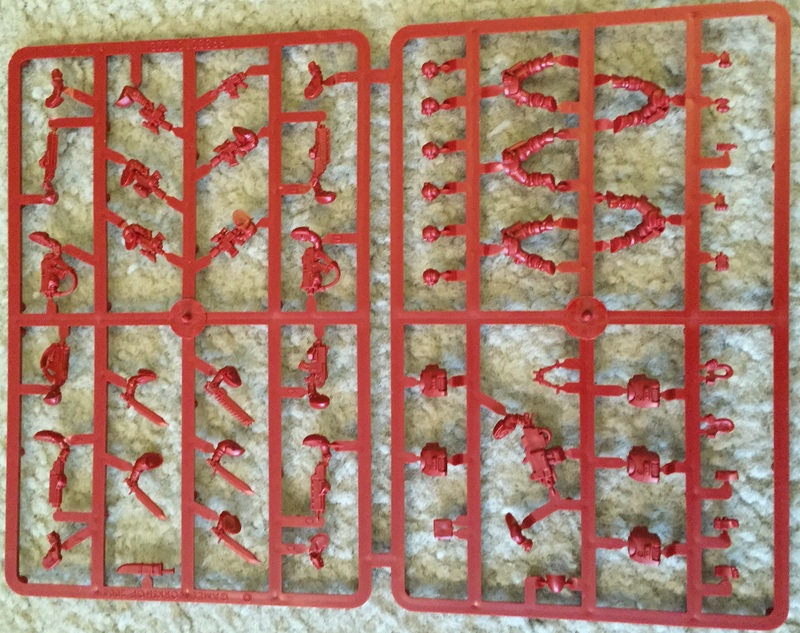 Each sprue is exactly the same. Here is one Space Marine Scout and one Genestealer fully assembled. Due to the colors, it’s hard to see the level of detail in these figures (which is probably why they are usually cast in grey), but I assure you it is the same level of quality that you get in the boxed sets. I had fun putting these together and decided what options I wanted to go with on each. There are no rules for the many variant parts each Tyranid or Scout can have, so unless you are building these for an actual 40K army, have a blast putting these together however you want! 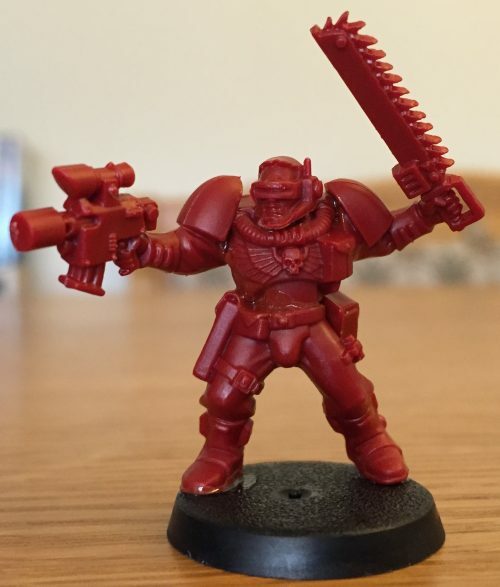 Here is the Space Marine Scout all by himself. I call him Slim. Which is an old school Marvel Comics joke. Here’s a side view of the Genestealer all by himself. Creepy creepy creepy. Finally, for those of you new to wargaming, I’ve included an Age of Sigmar figure as well as my Tomb Kings Bone Giant for a size comparison, and also to show you how nice Games Workshop pieces look painted up. I’m only a decent painter so rest assured when I tell you there are a lot of guys and girls out there who are infinitely more skilled than I am at this. Still, I wanted to give newcomers an idea of how fantastic minis look when painted compared to their basic one tone plastic (or metal…or resin) starting point. Go on and giving painting a try. If you have a Games Workshop store nearby, they might even give you a free painting class to help get your Scouts or Genestealers started! 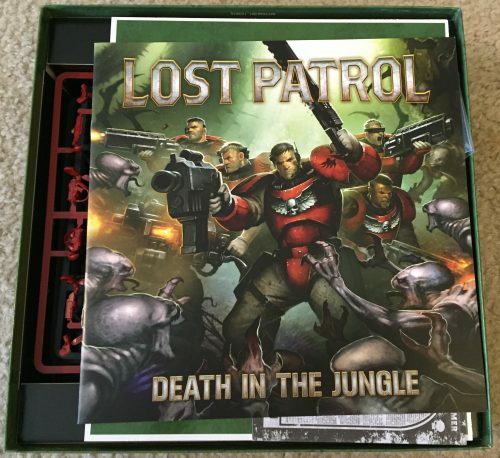 So there you go – a quick look at Lost Patrol‘s assorted bits. Remember that although it comes out on June 18th, you can start to preorder the game on June 11th. 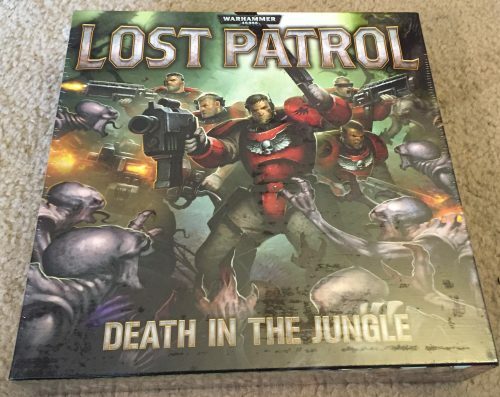 In fact, here is the direct link to ordering Lost Patrol. Now you don’t have any excuse! Remember it’s only $60, a fraction of what it would cast to just buy the minis in this board game, never mind all the extra bits like the tiles and dice. This is a fantastic way to dip your toes into the vast ocean that is Warhammer 40,000 if you are a newcomer, and yet another fun way to experience the game if you’re a long time veteran. The infestation markers come on the Genestealer sprues anyway, so they’re not actually an extra (you’d get them for your $70 too). But I agree that it’s a good value box if you want these models anyway – though I gather neither Scouts nor Genestealers are that popular in 40k. Good to know! You can tell I don’t play Tyranids. Of course, I don’t really play 40K at all save for two small Dark Vengeance based armies. I’m a Fantasy player (which is probably very obvious from the last photo).